Hello everyone, this shan’t be my usual post with recipe, or even a very long one – the Mister and I are on holiday, currently in the beautiful Bay of Plenty, NZ, at the dazzling Papamoa Beach. But I thought I might share a few of the tasty nibbles we have been enjoying with you. Mt Maunganui has a market every Sunday morning and of course this opportunity to fill my face with stuff from a new destination could not be resisted. The avocado depicted comes from a bag of four avocados that cost me only $3, sold to me by a nice old man who grows them in his garden. 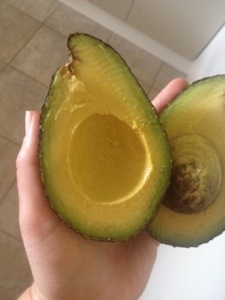 It is one of those avocados that fills me with joy when opened because it is perfect – all greeny-golden and buttery without a single flaw. It tastes marvellous slathered on a slice of loaf from a lovely Spanish girl with a bakery stall. 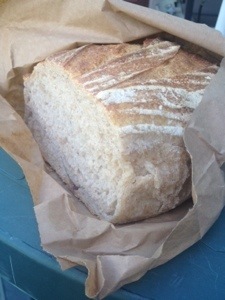 This loaf is the ‘Mt Maunganui Gold’ and billed as ‘crusty, chewy and yielding.’ Who could resist? And I am happy to report it does not disappoint. We spent a good long while happily sampling an impressive range of relishes and sauces at The Chilli Company stall. Eventually we settled on a bottle of Sweet Orange Chilli Sauce, which has just the right balance of sweet and bitterness with a good strong bit of chilli which lingers. Not unlike a delicious savoury marmalade, I suppose. 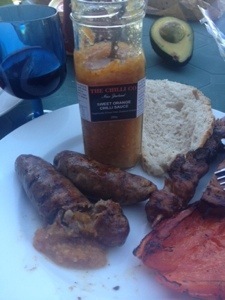 This sauce is lovely with the venison sausages depicted, from the Basecamp stall – very hearty and filling. Anyway dear friends, I am signing off for now – happy eating to all!